Ancient civilizations attached great importance to numbers as an exact language in which physical and spiritual ideals could be expressed and preserved; hence they built their numbers into their architecture which aimed at the ideal of eternity. The constellation of Orion represented the ‘resurrection god’ of many cultures, and in Egypt this was Osiris as well as his son and reincarnated self, Horus. Likewise these stories may make reference to the changing night sky by using a number related to 432. Now a closer look at three of the most remarkable structures ever created from civilizations long gone from the planet, Egypt's Great Pyramid, Mexico's Teotihuacan and England's Stonehenge. The precession causes the fixed stars to rise and set against the earth’s solar years so that at the first day of spring, which is the spring equinox, the constellation of the great age rises, we are in the last generations of Pisces rising before the constellation of Aquarius greets us. The Egyptians started their year at the summer solstice when the constellation Orion rose with the sun to mark the beginning of the flooding of the Nile. The Great Pyramid of Giza was the world's tallest building from c. 2570 BC to c. 1300 AD is the only remaining member of the Seven Wonders of the Ancient World. It is believed to have been built as a tomb for Fourth dynasty Egyptian pharaoh Khufu and constructed over a 20 year period concluding around 2560 BC. The Great Pyramid was clearly designed to embody ages of knowledge of cosmic and mathematical proportion in a single sacred structure that would last for all time. A key number embodied in this structure is 432. 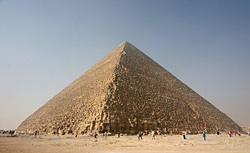 The height and perimeter of the Great Pyramid are in a ratio of 43,200 to the radius and circumference of the Earth. Take the original height of the pyramid (481.3949 feet) and multiply it by 43,200, the quotient is 3938.685 miles. The modern measurement for the actual polar radius of the Earth (pole to center) is 3949 miles. The perimeter of the 35th course of blocks, which is much thicker than any of the other courses, gives a figure for the precession of the equinoxes. In 1994 Robert Bauval and Adrian Gilbert published The Orion Mystery. Unlocking the Secrets of the Pyramids Bauval made a connection between the layout of the three main stars in Orion's belt and the layout of the three main pyramids in the Giza necropolis. The book contains scholarly writing which takes issue with the lack of theories by Egyptologists while making imagination stirring sensational hypothesis which helped turn it into a best seller. 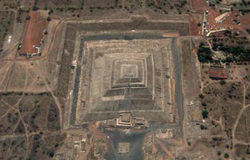 Central to the book is that the pyramid complex and the Great Pyramid incorporates star shafts 'locked in' to Orion's Belt and Sirius at around 2450 BC, though they argue the Giza ground-plan references a different great age -- or 10,450 BC. Also suggested by the great spinx and suggested by many psuedo science internet authors as commemorating the "birth of the Sun" a creation myth. the mayans used 5 in their ancient calendar. They calculated the precession cylcle (which is 25.920 years, the mayans called this the Great Great year) and divided it into 5 pieces of 5,125.36 years which was called the Great year. Also of particular importance to this web portal, carnval.com, after 360 days, there are 5 more days remaining which are set aside for the extraordinary or the first great Carnavals of humanity. Earth's Polar Radius: The Pyramid embodies a scale ratio of 1/43200. The height * 43200 = 3938.685 miles, which is the polar radius of the Earth to within 11 mi. Equatorial Circumference of the Earth: The Pyramid embodies a scale ratio of 1/43200. The perimeter of the base * 43200 = 24,734.94 miles, which is within 170 miles of the equatorial circumference of the Earth. Mass of the Earth: The weight of the pyramid is estimated at 5955000 tons. Multiplied by 10^8 gives a reasonable estimate of the Earth's mass. Average Land Height: The average height of land above sea level for the Earth is 5449 inches. This is also the height of the pyramid. The Sun's Parallax: The size of the Earth as viewed from the Sun and expressed as an angle and generally taken to be 1/2 the diameter at the equator (Solar Equatorial Parallax) is 8.9008091 seconds of arc using 91848817 miles as the mean distance to the sun and 3963.4914 miles as the equatorial radius. The distance between the mean socket level and the height of the levelled bedrock is 8.9008 Pyramid Inches. The Descending Passage pointed to the pole star Alpha Draconis, circa 2170-2144BCE. This was the North Star at that point in time. No other star has aligned with the passage since then. The 344ft length of the Descending Passage provides an angle of view of only +/- 1/3 of a degree. Alpha Draconis has not been in alignment for thousands of years. The next alignment will be with the North Star, Polaris, in about 2004CE. Polaris in Greek means "Satan". The southern shaft in the King's Chamber (45 deg, 00 min, 00 sec) pointed to the star Al Nitak (Zeta Orionis) in the constellation Orion, circa 2450BCE The Orion constellation was associated with the Egyptian god Osiris. No other star aligned with this shaft during that Epoch. The southern shaft in the Queen's Chamber (39 deg, 30 min, 00 sec) pointed to the star Sirius, circa 2450BCE Sirius was associated with the Egyptian goddess Isis and is also part of a unique ceremony practiced by the African Dogon tribe. Marks Spring Equinox: Due to the angle of the sides of the pyramid vs. it's latitude, it casts no shadow at noon during the spring equinox. The length of a base side at the base socket level is 9 131 Pyramid Inches or 365.24 Pyramid Cubits. The length of a base side at sidereal socket level is 9 131.4 Pyramid Inches or 365.256 Pyramid Cubits. The length of the perimeter at the sidereal socket level is 36 525.63629 Pyramid Inches. The height to the missing apex is 5 812.98 Pyramid Inches. All measures of interest are derived from three basic units: for distance, mass, and time. The United States of America is the last country to use the Imperial system for mass and time. The similarities with the pyramid inch mean this measurement is more in tune with the rhythms of the universe than the more convenient French derived metric system as shown by the many ways 432 can be derived from major measures of nature. A pyramid inch is equal to 1/25 of a "sacred cubit" whose existence had earlier been postulated by Isaac Newton who had noted how this number would produce whole numbers. The pyramid inch and sacred cubit are found as raised images on a red granite plaque at the entrance to the Antechamber of the King's room of the Great Pyramid. 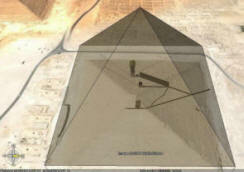 1 pyramid inch = 1.00106 English/American inches, or 2.5426924 centimetres. Early researchers beginning with John Greaves (1602 - 1652) found numerous apparent coincidences between the measurements of the pyramids and the geometry of the earth and the solar system. This has led researchers to conclude that the British system of measures was derived from a far more ancient, if not divine, system. The metric system was demeaned as being atheistic. Time, on the other hand, has not been metricated in everyday use: years, months, weeks, days, hours, minutes, and seconds, with non-decimal conversion factors, are used. The ancient and many modern Maya groups believe that the universe has been renewed four previous times. Each prior attempt at the human creation was destroyed by a different catastrophe which ended the universe. The astronomically-based Mayan calendar will be completing its first great cycle of approximately 5,200 years on the 21 December 2012. Although there is no substantial evidence that the ancient Maya considered the date significant, many people have postulated that this is the "end of the Universe" from the Mayan perspective, and others believe that the Mayans meant this to symbolize the "coming of a great change." Terence McKenna "suggests that the position of winter solstice sun within 3 degrees of the Galactic Center in the year 2012 A.D. (a "once-in-a-precessional- cycle" event) may provide the eschatological end point for his theory of time known as Timewave Zero. His end date was chosen for historical reasons and was, apparently, only later discovered to correspond with the Mayan end date. The McKenna brothers point out that this unusual astronomical situation has been noted by other writers, namely, Giorgio de Santillana and Hertha von Dechend in Hamlet's Mill (1969). As ACS Publication's The American Ephemeris for the 21st Century shows, in the year 2012 the Galactic Center is at 27 Sagittarius (within 3 of winter solstice). Thus McKenna demonstrates that on winter solstice of 2012, Galactic Center will be rising heliacally just before dawn, in a way reminiscent of how the Maya observed Venus's last morning star appearance." Today many earth/cosmos spiritual practitioners or shamans conduct a ritual that will beckon in the prophesied Age of Peace, 500 years of unity and shared vision between peoples who have, for the last 500 years of Darkness, allowing all of humanity to move from the depths of war into the light of peace. The Mayan fifth world finished in 1987 as commemorated with the Harmonic Convergence with the sixth world starting in 2012 but what this is foretold to mean is actually blank. So we are currently "between worlds". This time is called the "Apocalypse" or revealing. A time for truth to be revealed and hopefully set us free. We're doing our part here and wish you peace and blessings fellow traveler as we hope the great shift in consciousness moves us closer to peace in our time. The site of Teotihuacan emerged in the Valley of Mexico by 300 - 100 BC, in conjunction with the age of Pisces and at its height in AD 600 would have held a population of c. 125,000 people. Teotihuacán's rise coincided with the classical Romans' building of their great monuments, and with the beginning of cultures in Mexico's Yucatán Peninsula, Oaxaca, and Puebla. The Toltecs are generally given credit with building the largest pyramid, known as the "The Pyramid of the Sun," which among other things, is in an alignment to coincide with the two days (May 19th and July 25th) when the sun would be directly over the top of the pyramid at noon. The culture and architecture of Teotihuacán was influenced by the Olmec people, who are considered to be the "mother civilization" of Mesoamerica and are best known for their giant heads with Negroid features. In the 1970's, a civil engineer by the name of Hugh Harleston Jr. made some 9,000 measurements of Teotihuacan over a 30-year period. He concluded that the entire complex was a precise scale-model of the solar system. If the centre line of the Temple of Quetzalcoatl was taken as the position of the sun, markers laid out northwards from it along the axis of the Avenue seemed to indicated the correct orbital distances of the inner planets, the asteroid belt, Jupiter, Saturn (the Sun Pyramid), Uranus (the Moon Pyramid) and Neptune and Pluto, represented by two mounds further north. The grand buildings of Teotihuacán were laid out in accordance with celestial movements. The front wall of the Pyramid of the Sun is exactly perpendicular to the point on the horizon where the sun sets at the equinoxes (twice annually). The rest of the ceremonial buildings were laid out at right angles to the Pyramid of the Sun. The Hunab:Among his findings was that the site was constructed according to a system of measurement he named the STU, Standard Teotihuacan Unit, which is equals 1.059 meters. This unit features into the length of a side of the Pyramid of the Sun and the Pyramid of the Moon - and even into the distance between the two pyramids. 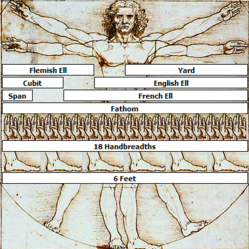 Harleston also named this unit of measure the Hunab after the Aztec God of measure, Hunab Ku. In addition, one STU is equivalent to the width of the Stonehenge lintels and to the "Jewish rod" of 3.4757485 feet. Graham Hancock describes: "In brief, the angle of the fourth level of the Pyramid of the Sun is set at 19.69 degrees, the exact latitude of the pyramid itself (which stands at 19.69 degrees north of the equator). "One look at the pyramidal structures of Yucatan and Chiapas with their corbelled walls rising to single moveable capstones, like the Grand Gallery at Ghiza, or the "tombs" of Mycenae, or the Megalithic structures at Maes-Howe on the west coast of Britain, is enough to show they were built for astronomical observation with frets and cockscombs that could function as markers for the rising, transit, and setting of heavenly bodies."